Archive results for "By-election 2018"
Electoral Commission of Zambia (ECZ) Poll Staff trained to undertake electoral duty in the 20th November, 2018 election for Council Chairperson in Lupososhi District have been subjected to the ‘Assessment on the Forms’ Aptitude Test on 17th November, 2018 at Luwingu Secondary School bringing a close to the training of Poll Staff in the District. Returning Officer for the 20th November, 2018 Polls for Lupososhi District Council Chairperson Mr. Christopher Simusokwe has told political parties in the District to ensure peaceful conduct of elections in the District. 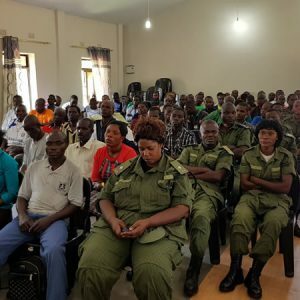 Various stakeholders met today Saturday, 17th November 2018 at the Solwezi Municipal Council Chamber. The meeting was attended by participating political parties, the police and Civil Society. Notice is hereby given to the general public that the Electoral Commission of Zambia has prescribed Tuesday, 20th November, 2018 as the date on which to hold the Council Chairperson’s Election in Lupososhi District and Parliamentary by-election in Mangango Constituency of Kaoma District. On the same date, the Commission will also conduct Four (4) Local Government by-elections in Chisanga Ward of Ngabwe District, Lusinde Ward of Petauke District, Nkhanka Ward in Chama District and Tumvwanganai Ward of Solwezi District. By-Elections in FIVE (5) Council Wards which took place on Thursday 6th September, 2018. The Electoral Commission of Zambia (ECZ) has determined the dates for nominations and polls for the Kasenengwa Parliamentary and Five (5) Councillor By-elections as 9th August and 6th September, 2018 respectively.